We are looking forward to an exciting year with our student musicians. Like other programs, the NHS Music Program needs your support in order to thrive. Recent education budget cuts affected our school greatly, in particular the chorus and band programs. In order to maintain the standards of excellence that our program has achieved, parental and community support are more critical to our program than ever. Within this section, you will find information about donations and fundraisers that will help support our music programs. We anticipate other fundraising efforts throughout the school year, thanks to the generosity of many Newark businesses. Please be on the look out for event flyers and check out our fundraiser webpages for updates on how our programs are fairing and how you can help. We greatly appreciate the support of our family, friends, alumni and community. The Newark High School Music Boosters is 501(c)(3) non-profit organization that supports ALL our music progams. Your tax-deductible donation is always gratefully accepted and used for the sole purpose of the NHS Music Programs. You will receive a letter of acknowledgment that includes our tax ID. 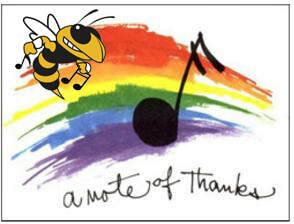 Our heartfelt thanks to you for supporting our music programs and our student musicians! Support Newark High School Music Boosters. Amazon Smile is a free program (no cost to you!) where you can choose a charity that Amazon will donate a portion of your online sales. So whether you are holiday shopping or simply making regular purchases throughout the year, please consider signing up for a Smile account and help us raise money for our NHS music programs. Thanks for your support! If you prefer to use a credit card for your donation our only option at this time is to donate though a go-fund-me account that was set up to benefit the Newark High School Music Program. Please click here to donate. We greatly appreciate your support!